What’s your relationship with food? For some, food is a question of sustenance–keep it simple as long as it satisfies your hunger and the need for energy. For others, being a foodie is a badge they wear with a boy scout’s pride, having earned their status in countless restaurants and paying what amounts to the GDP of a small country for all their fabulous meals. I find myself somewhere (happily) in the middle. Don’t get me wrong: I do have a food fixation. I always seem to be hungry and am often thinking about my next meal before I’ve finished the current one. But, at least when it comes to travel, I think of food as an edible snapshot of the place I’m visiting–a tasty roadmap that illustrates how the local culture has maintained its traditions, how it has evolved, and how it continues to push boundaries. New York City is the perfect city for travelers and for people who can’t travel as far afield as they’d like. It’s an international melting pot (salad bowl/pizza pan/wok?) where the culinary selections are as diverse as its inhabitants and its visitors. Five days is hardly enough time to sufficiently explore the New York food scene, but it’s certainly a challenge worth taking on. As a family, we shared input about places we’d liked to sample, and, allowing for serendipity, selected locations that worked geographically and logistically with our sightseeing plans. 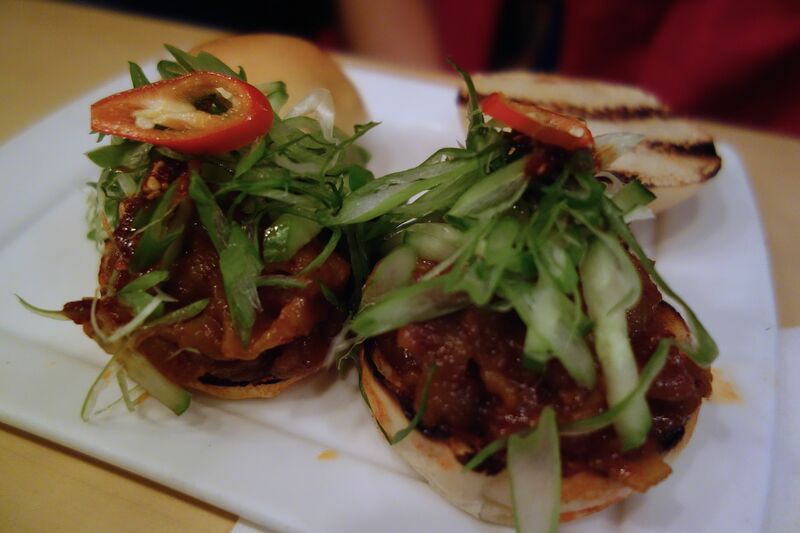 Hands off my pork belly sliders! We tend to order family-style so that everyone can have a smörgåsbord sampling of lots of different dishes. Danji‘s modern and traditional Korean fusion small plates were ideal for that. And had we known how delectable everything was going to be, we would have ordered more. It took every ounce of control not to throw eye-daggers at someone who took one too many helpings of the spicy pork belly slider. Family or not, one must not take more than one’s fair share of helpings, especially when the food is as salivation-worthy as our meal was. I think that’s a commandment or something. And if you choose to sample Danji’s delights, get there early. We were tenth in line, twenty minutes before they even opened for lunch. Banglashi or Indian or both? 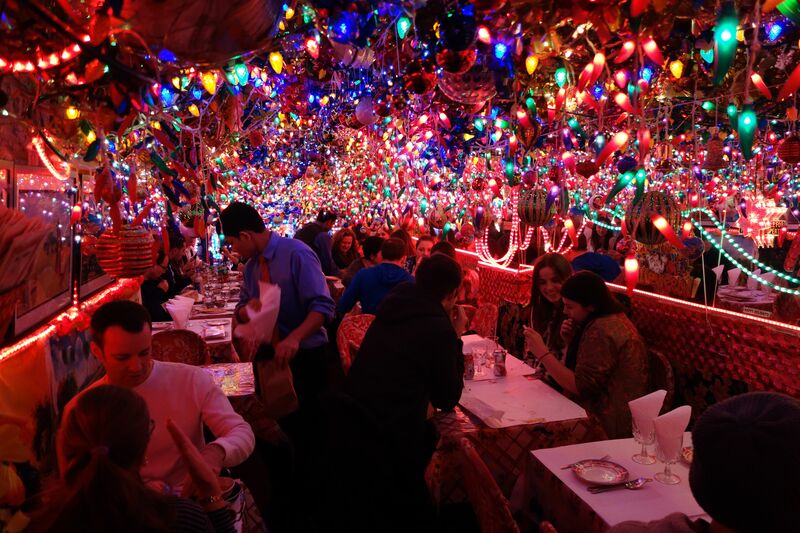 When we craved Indian food, we followed the pungent scent of curry to 6th street. Standing on the stoop of each restaurant, exuberant and fast-talking hosts tried to charm us into their dining rooms with phrases like, “Come, you try. Very good. 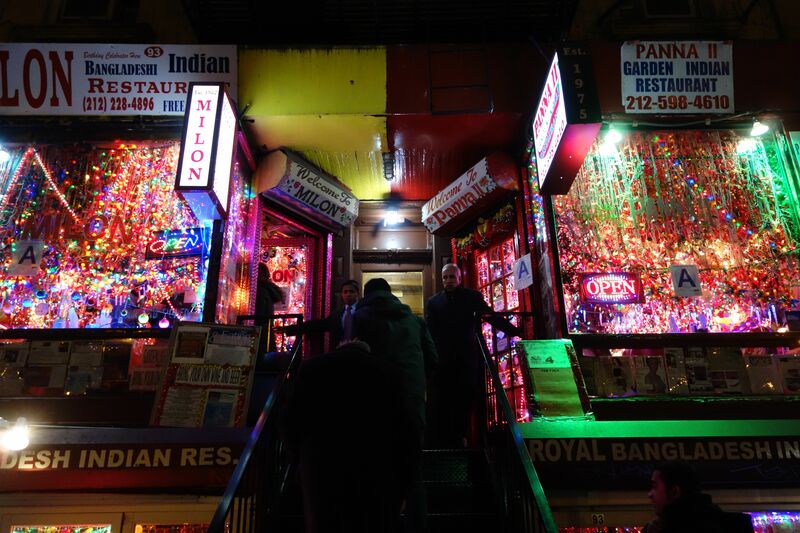 Very very good food.” We settled on a Bangladeshi/Indian joint and were not disappointed. Droplets of multi-colored lights hung from every inch of the ceiling. 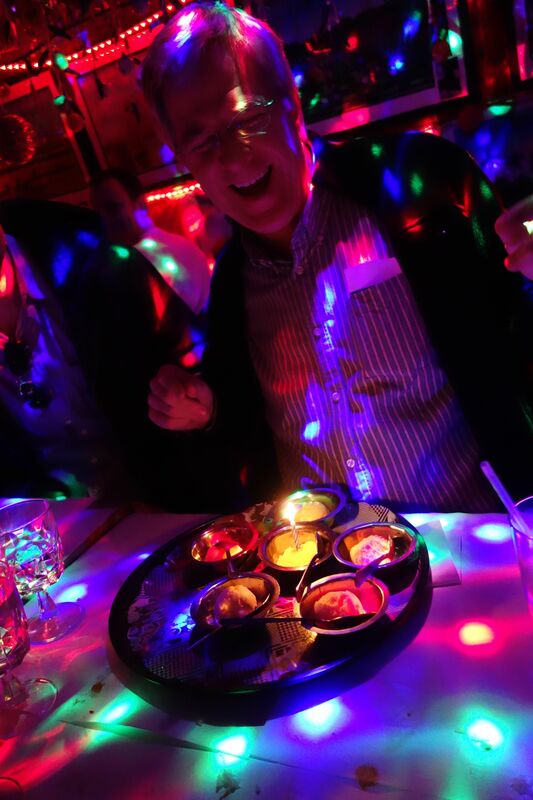 Indian pop music reverberated in my ears and my chest and made me almost certain that the restaurant would break out into a Bollywood dance. Curry-drenched veggies and meats arrived and were quickly gobbled up with fistfuls of garlic naan and precious miniature mountains of rice. Jackie, Andy, and their cousin Nikki secretly informed the server that it was Rick’s birthday (which it was not), and when the birthday dessert arrived, we all joyously played along. You say it’s your birthday; it’s my birthday too yeah! Quality food and attention to service are important ingredients for a memorable meal. 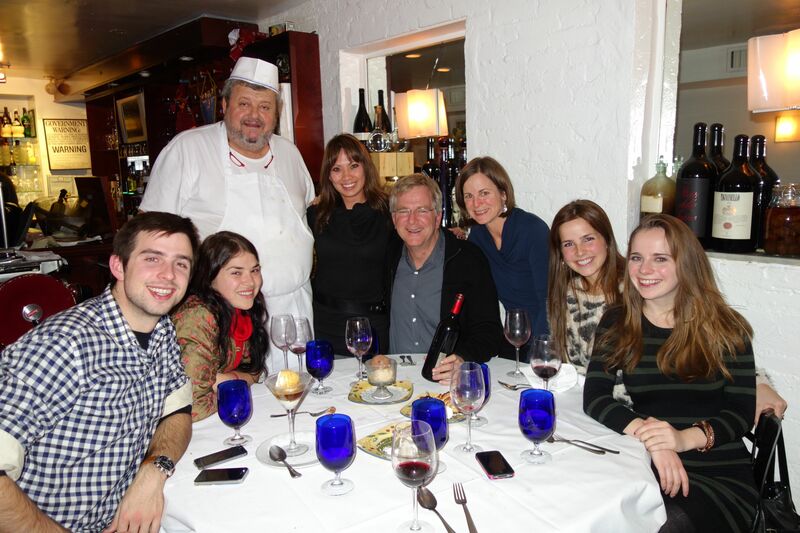 Jackie’s friend recommended that for our “fancy” meal, we should go to Sandro’s–a veritable New York institution where the round and jolly chef/owner conjures up traditional dishes from his native Rome–never overdone, never over-sauced, and never pretentious. Quality ingredients yield quality meals, but there’s something about Sandro’s that adds to the meal beyond the perfect flavors and the perfectly paired wines. It’s something intangible, but the result is palpable, electric, and powerful. And I think it’s that everyone working in that restaurant cares about your dining experience. They want you to savor each bite. They know that food is meant to be relished, not just eaten. They anticipate your needs. Yet they offer you the right amount of privacy to enjoy the moments with your dining party. And enjoy we did. 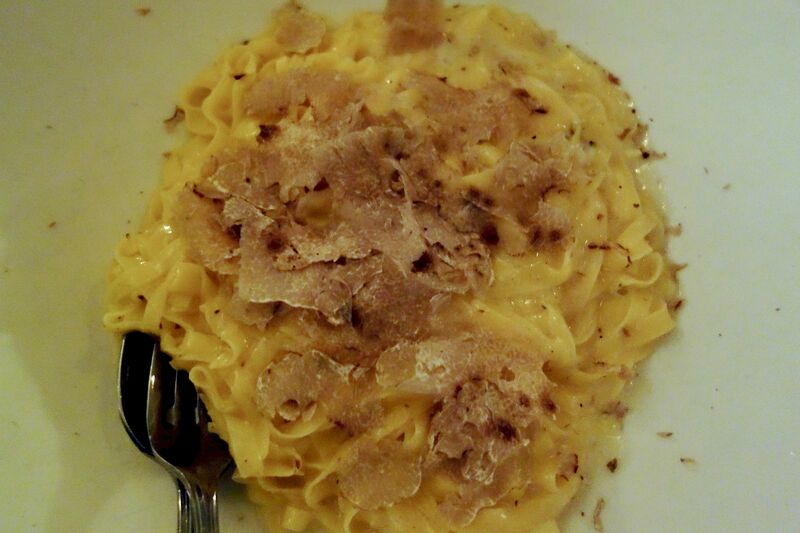 A delicate pasta huddles under exquisite white truffle shavings. Gathered around a circular table, we found ourselves eating slower than normal for three reasons: we were enjoying our time, talking, listening, laughing, singing, and just being together; copious amounts of expertly paired wines kept us in a steady deceleration mode; and because we didn’t want any of our courses to end. Even though we ordered a wide and plentiful variety of dishes, when each plate is divided seven ways, you really only get a few tastes of each, and that makes such tempting morsels even more precious…especially the ones swathed in white truffle shavings. At the end of the meal, Italian-speaking Sandro came by to see if everything was to our liking. We applauded him and his culinary skills, and, like food groupies, asked if he would take a photo with us. He obliged and gave us plates emblazoned with the restaurant’s logo as a souvenir of our delicious experience. But memorable food experiences are not exclusive to highbrow or hipster meals. 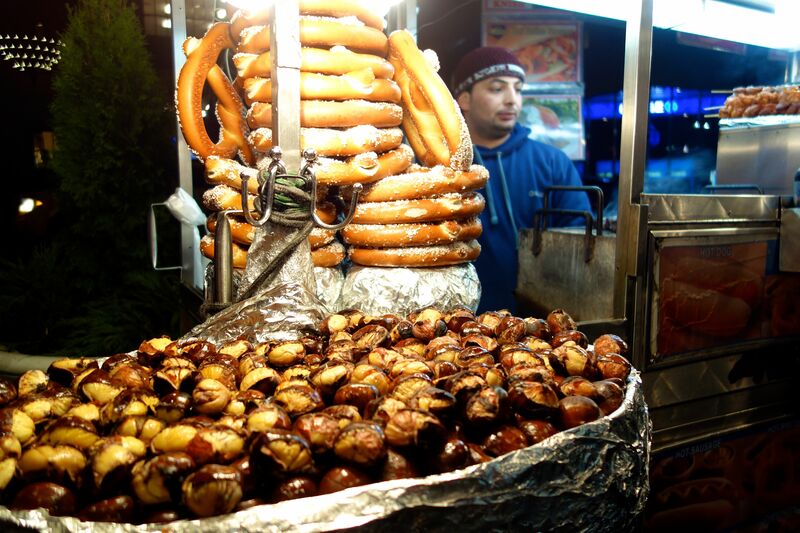 Street food and fast (but tasty) food are essential elements of any visit to Manhattan. While we missed the opportunity to chow down on hot dogs (an error to be remedied on my next visit to the city), piping-hot roasted chestnuts and salt-speckled pretzels satisfied our hunger pangs, saline cravings, and touristy curiosity. Two Boots Pizzeria at Grand Central Terminal. On two occasions, we scarfed down pizzas. Two Boots Pizzeria‘s Grand Central Terminal location was a ideal for our lunchtime break. The vibrancy and organized chaos of travelers on the move added an energetic background for our scrumptiously seasoned taste of the square-cut pizza. 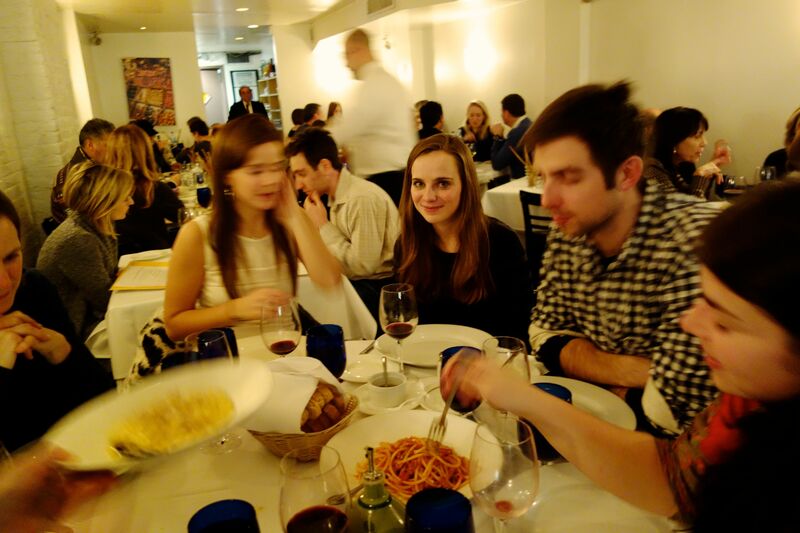 And huddling seven people together at two teensy tables made the experience feel communal and quaint. 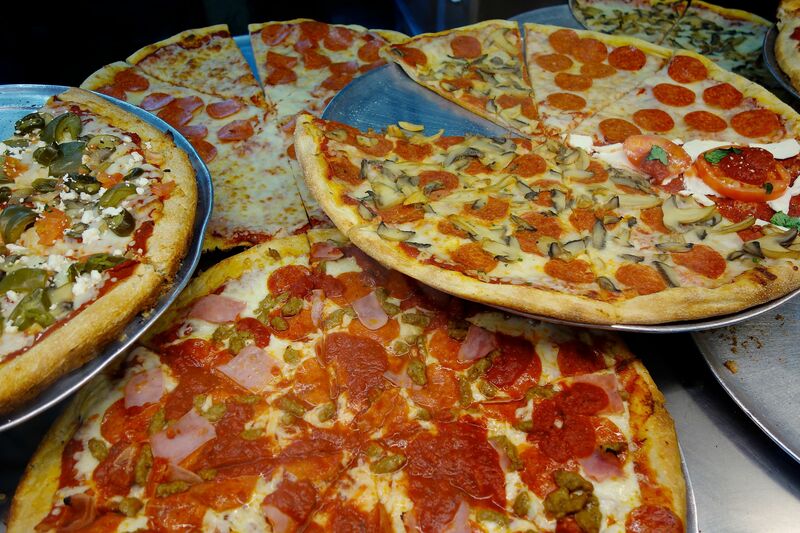 Sometimes all you need is a slice of pizza from a greasy pizzeria. 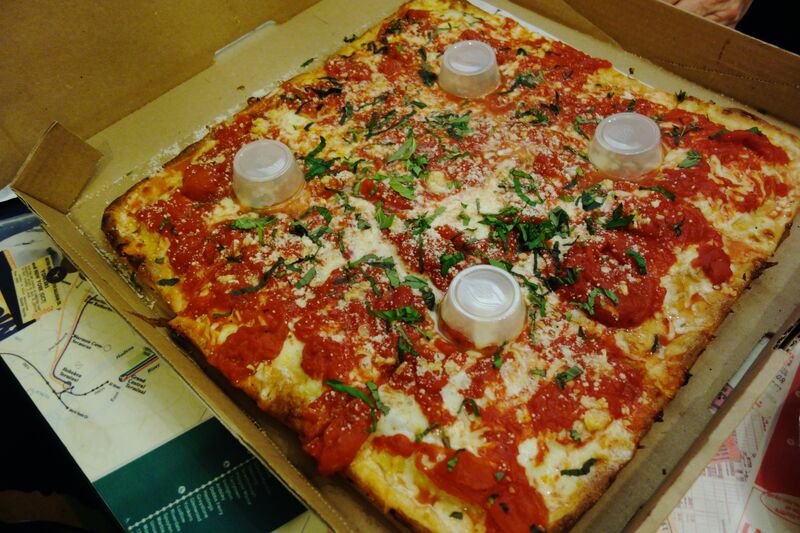 Later in the trip, we used Yelp to help find a “4-star” pizzeria near 1 World Trade Center. A divey little joint run by latino immigrants was what we got and exactly what we needed. Between Andy, Rick, and me, we managed to eat ten different slices of manhole-sized pies for very little money. We left nothing behind but piles of crumpled napkins coated in cheese grease and tomato sauce streaks. 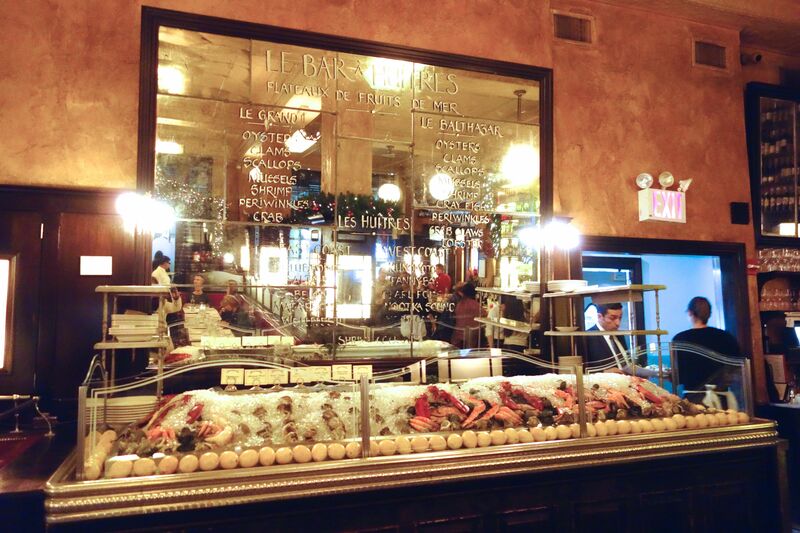 Balthazar’s shrine to seafood beckons New Yorkers and tourists alike. 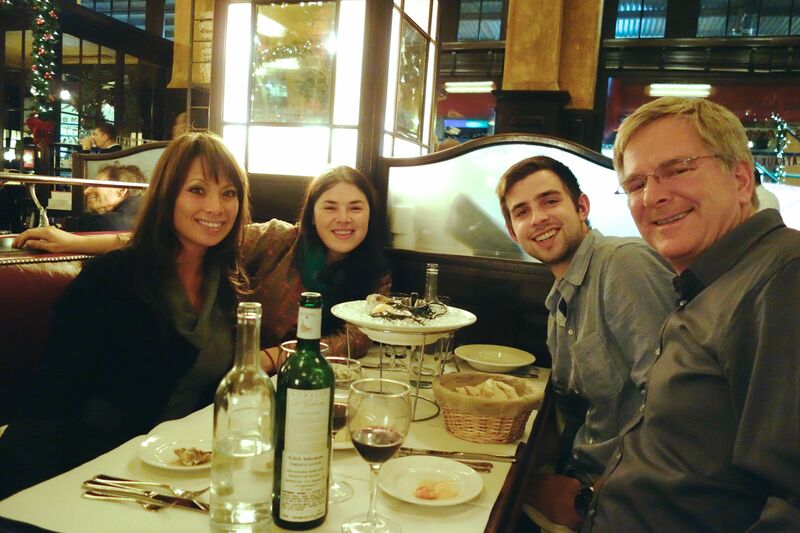 At our last big meal, Nicolina suggested one of her favorites: Balthazar. Here, the trendy, the nouveau riche, the wannabe riche, young and old, the hipsters, the artists, any New Yorker who appreciates a good thing, and the tourists in the know gather in the grand, old-world style French brasserie and celebrate life’s little triumphs. It’s the democratization of quality food. For us–Andy, Rick, Nicolina, and I–it was about celebrating a stellar family vacation, wishing Jackie, Linda, and Caleigh hadn’t left so early, and indulging in one last fine meal before returning to the real world. Splitting two desserts between the four of us makes this kind of indulgence reasonable. 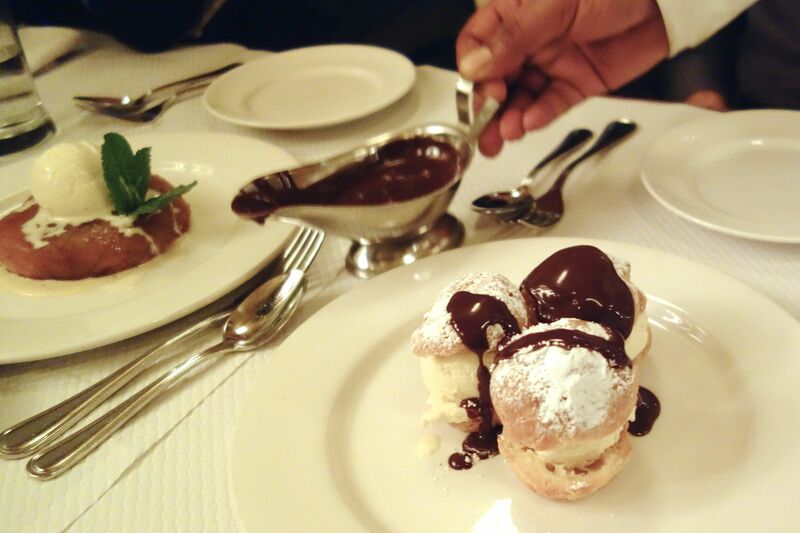 Fine food, quality conversation, and stellar company make any dining experience memorable. And here is where I noticed how the art of conversation can elevate an already fine meal to memorable heights. Yes, my palette will remember the two orders of succulent oysters and monster prawns; the lanky langoustines; the escargots drowned in garlic, butter, and parsley; the salt-lick duck confit with the crispy yet plush pomme frites, the decadent cheese plate, and the even more decadent dessert duo of tarte tatin and profiteroles. But having substantial discussions about life, art, travel, politics, careers, love, and adventure over such a meal is the quintessential good eats experience. It’s more than just consuming delectable food; it’s indulging in good company and savoring each moment. Loved reading this article. Eating and traveling are our favorite things! Great memories. Vivid descriptions. Let’s do it again! You just say the word, and it’s on! I’ve eaten at that Indian place too! And we also pretended it was my birthday. So funny! Haha! I can totally picture you doing that Kelly.